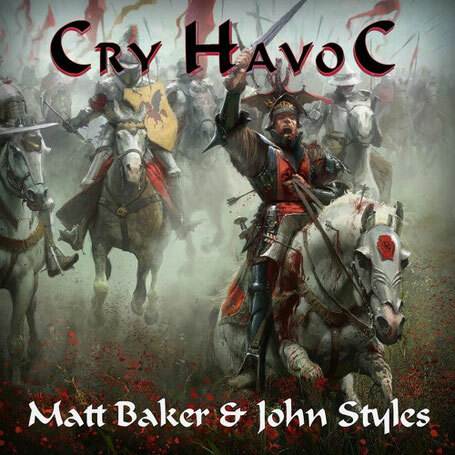 The inspiration for this track came from the saying "Cry 'Havoc! ', and let slip the dogs of war" from Act 3, Scene 1, line 273 of William Shakespeare's Julius Caesar, although I prefer to think of it from the medieval battle setting in Henry V.
In a literal terms, "dogs" are the familiar animals, trained for warfare; "havoc" is a military order permitting the seizure of spoil after a victory and "let slip" is to release from the leash. Apart from the literal meaning, a parallel can be drawn with the prologue to Henry V, where the warlike king is described as having at his heels, awaiting employment, the hounds "famine, sword and fire". Along those lines, an alternative proposed meaning is that "the dogs of war" refers figuratively to the wild pack of soldiers "let slip" by war's breakdown of civilized behavior and/or their commanders' orders to wreak "havoc", i.e. pillage and plunder. I used the drums, percussion and various vocal elements to try and capture a sense of tension and the underlying threat that the 'Unleashing of Havoc', must have created. This is punctuated in the composition with softer reprieves from the chaos of war, which I felt represented 'innocence' either in terms of the younger soldiers who were yet to be 'bloodied'; and as a representation of the 'innocence' they are about to destroy by warfare, pillage and plunder. Its strange really as I've always wanted to do a track with this title/theme, but in composing it I felt it is somehow less 'heroic' and a lot 'darker' than some of my previous compositions of a similar theme. I guess its power comes from the representation of the barbarism that ensued during medieval warfare. We hope you've enjoyed our creation and welcome any comments and feedback. Eufonica - Cascade EP (InWinter Remix) Supported by:Radio Go On Air,Tempo Giusto - Global Sound Drift,djphalanx,CASW,DJ FEEL. InWinter-Poltava (Original Mix) Supported by: Karanda,Suzy Solar,Richie Hawtin,Gai Barone,Shlomi Levi,SvenDeeKay,DJ SERV,Freies Radio Goeppingen e.V.,Philip Langham.